Negative existentials, sentences like Sherlock Holmes doesn’t exist, are particularly problematic for the direct reference theory of proper names. According to this theory the meaning of a proper name is just its referent. Since Sherlock Holmes lacks a referent, it seems that Sherlock Holmes doesn’t exist cannot express a proposition. But then it is very hard to explain why that sentence is (or seems to be) true. Moreover, if that sentence is true, then it must be that it expresses a proposition, but that is something that direct reference theory cannot claim, or at least not without further argumentation. Direct reference theory is quite simple and elegant, but it also gives us few resources to deal with negative existentials: there’s hardly enough meaning to explain this kind of phenomenon. This is where Fregeans, and descriptivists more generally, seem to have an advantage over direct reference theoryists. If the meaning of proper names is somehow descriptive, then it’s easy to see how negative existentials express proposition. The proposition expressed by our example would be something along the lines of The brilliant detective that lives in Baker Street 221 B doesn’t exist. A descriptivist has no problem recognizing the existence and truth of this proposition. Imogen Dickie proposes to extend the account of reference-fixing for proper names from her recent book Fixing Reference to cover the case of our understanding of proper names in fiction. Very roughly, the idea in the book is that reference-fixing is a kind of focus: a reference-fixing relation does its aboutness-fixing work by making available an information-marshalling strategy which enables the subject to achieve what she calls ‘cognitive focus’ on things outside the mind. Her new paper will explore a treatment of our understanding of names in fiction as running this kind of ‘attempt to sustain focus’ routine within the scope of the subject’s knowledge that there is not really any object there upon which focus might be sustained. Friederike Moltmann will argue that the compositional semantics of natural language requires positing both intentional and fictional objects, where intentional objects are non-actual objects of which existence predicates cannot be truly predicated and fictional objects are objects that exist as fictional characters. The paper develops an account of intentional objects based on failed or pretend acts of reference and the coordination among referential acts. Stephen Yablo proposes a way in which a direct reference theorist can solve the problem posed by negative existentials. Using his aboutness theory, Yablo argues that even though Holmes exists is not strictly speaking evaluable, it has a false implication. According to Yablo, the false implication is that not everything has properties that prevent it from being Holmes. Thus, Holmes exists is false because part of what it says is false, and Holmes doesn’t exist is true because part of what it says is true. Papers should not exceed 10,000 words and should be submitted in PDF, LaTeX, or Word format to the following email address: rmena[at]filosoficas[dot]unam[dot]mx. 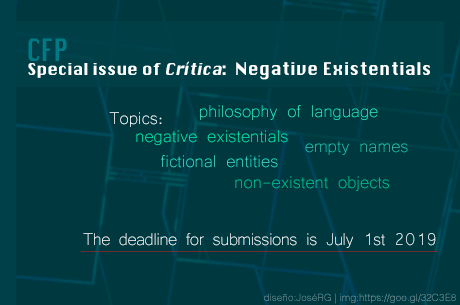 The deadline for submissions is July 1st 2019.